In Unintended Consequences best-selling author George Erickson exposes the lie that created our extreme radiation safety standards, the damage those regulations have caused, and his contempt for "greens" who profit from promoting 30% efficient, carbon-reliant solar panels and bird, bat and human-killing, CO2-producing windmills, but oppose environment-friendly, CO2-free, 90% efficient safe, nuclear power. 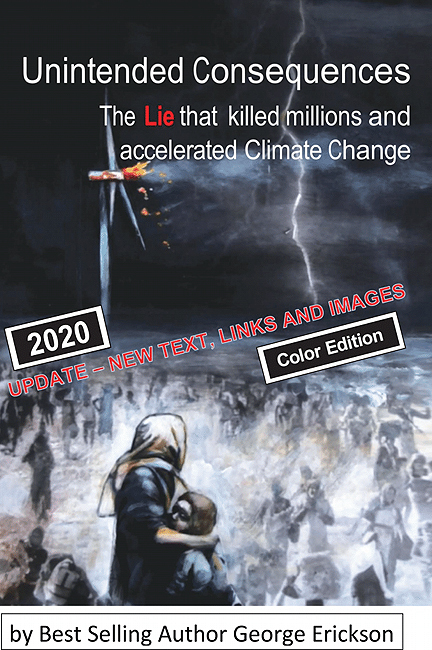 With startling images and input from of engineers, physicists and specialists in nuclear medicine, the author urges closed-minded organizations like the Sierra Club, Friends of the Earth and Greenpeace to emulate real environmentalists like Stephen Tindale, James Lovelock and Stewart Brand, who had opposed nuclear power, but now support it as the safest, most efficient way to produce the 24/7 electricity we must have to effectively combat Climate/Ocean Change. Dr. Alex Cannara, BS & MS EE, PhD Mathematical Methods, Menlo Park, California. George Erickson is a member of the National Center for Science Education, a past V.P. of the American Humanist Association, a past President of the Minnesota Humanists, a member of the Thorium Energy Alliance, the Sierra Club, the Nature Conservancy and more.